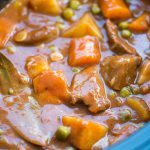 Slow Cooker Lamb Stew with tender fall apart lamb chunks and hearty vegetables have a rustic flavourful wine based gravy. This Lamb Stew is definitely going to keep you warm in the winter. A warm comforting bowl of stew is a winter staple. While Beef Stew is the ultimate stew for the winter, this Lamb Stew is equally delicious. Lamb and vegetables are cooked in slow cooker until really tender and Juicy. Lamb is cooked in a red wine based broth along with herbs, cinnamon and bay leaf. I am having a big bowl of this Lamb Stew right now while writing the post. It is so much comforting and satisfying. We celebrated Diwali a couple of days back. Diwali is a festival of light. We light lamps, firecrackers and of course, there are loads of food. Ideally, the preparation starts a week ahead. Traditional sweet loaded with ghee and sugar are the highlights. And belives me you just can not say no to those amazing spreads. After all, it is once in a year fair. But the downside of having so many sweets is you will be in a food coma for the following week. I am tired and my legs are numb after a week-long of preparation and cooking. After 3-4 days of indulgent eating, I am getting back to simple comfort food. Now is the time to put the slow cooker to use. Dump everything thing into the slow cooker and you will have a delicious dinner ready. That’s the reason I make these slow cooker recipes quite often MEXICAN CHICKEN SOUP, QUINOA CHICKEN BROCCOLI CASSEROLE, SLOW COOKER CHICKEN STEW. 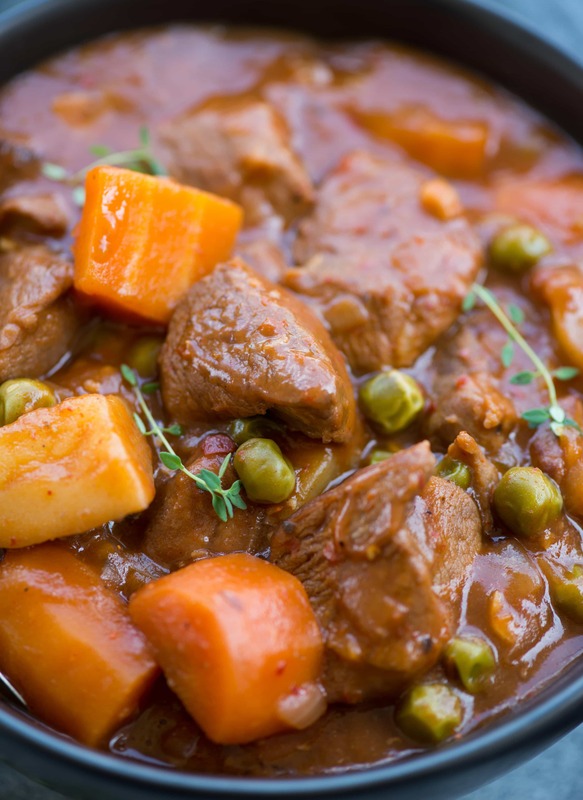 WHY THIS LAMB STEW IS THE BEST? This is the best Lamb stew and I have no doubt about it. It is very easy to make with very minimal preparation. It starts with browning the Lamb pieces followed by caramelizing Onion and Garlic. The caramelized brown bits of the lamb adds so much of flavour that this extra step would seem worth the effort. Once this step is done, just dump all the ingredients to the slow cooker and forget. The meat and vegetables would cook slowly by absorbing all those flavours. This Lamb stew is a meal in itself. So make a big batch of it and enjoy the rest of the week. The flavours really intensify when the stew is one day old. So a perfect meal that you can make ahead and store. With the right proportion of meat and vegetables, it is a well-balanced meal. You can customize it and add or remove vegetables as per your choice. Mushroom would be a good addition to the stew. WHICH CUT OF LAMB SHOULD I USE? 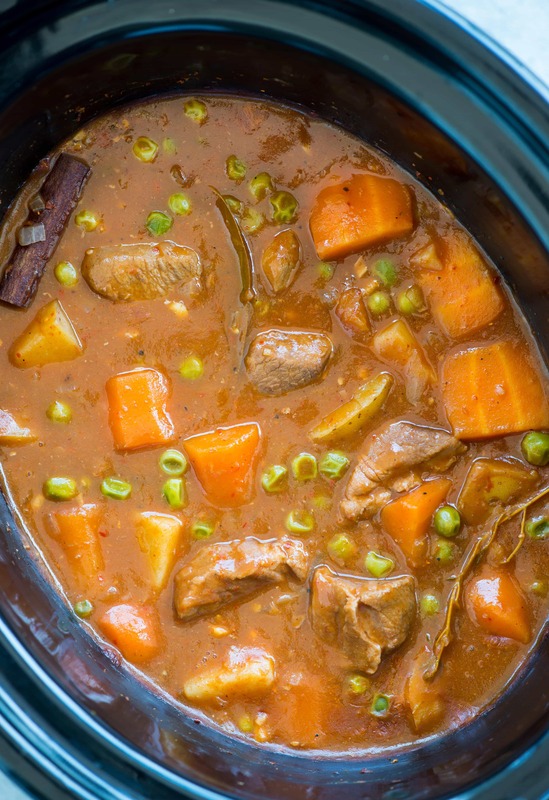 Boneless Lamb Shoulder or Leg of Lamb works best for this Stew. Trim any extra fat while getting it from the local shop. If you are using frozen meat, then thaw overnight for even cooking. TO MAKE LAMB STEW ON THE STOVE TOP / IN INSTANT POT? 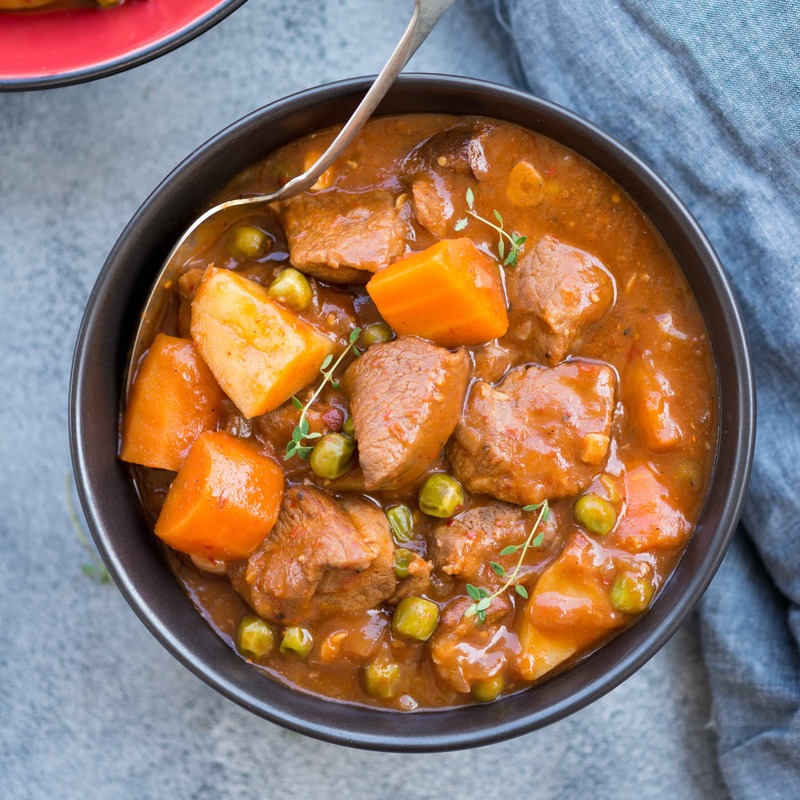 If you are sort of time or don’t own a slow cooker, you still can enjoy this incredible Lamb Stew. 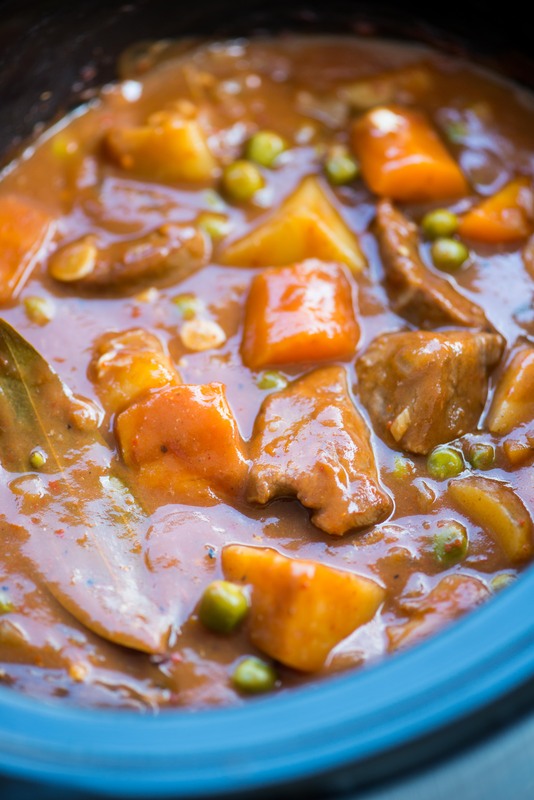 You can either use a heavy bottom Soup Pot or Instant Pot to make this stew. To make on Stove Top: Take a heavy bottom Dutch Oven. Heat Oil and brown seasoned Lamb chunks. Add chopped Onion and Garlic. Saute along with Lamb until onions have softened. Then add the rest of the ingredients. Once everything comes to a boil, simmer and let it cook on very low heat for 2 hours. You might need a little bit of more stock because of more evaporation while cooking on stove top. 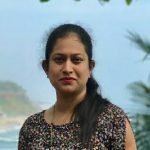 To make in Instant Pot: When you are really sort of time, the magical Instant Pot will make your life easy. 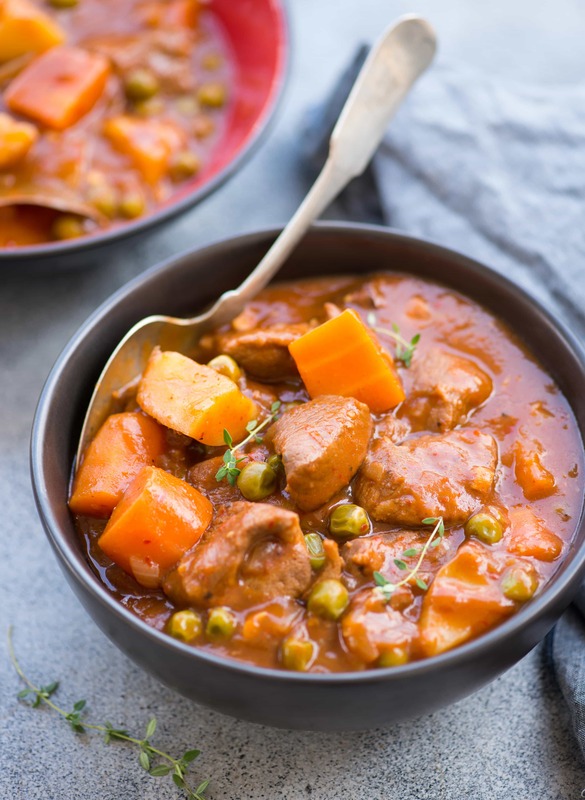 It is remarkably easy to make this Lamb Stew in the Instant Pot. You can either brown lamb in batches in the Instant Pot or brown in a pan and add it to the Instant Pot. Then add all the ingredients. Cook on high pressure for 10 minutes, followed by natural Pressure release. Serve this Lamb Stew with Crusty bread or with fresh green salad. Pat dry Lamb Chunks to remove any extra water. Season with salt and pepper. Sprinkle flour and toss well lamb pieces are well coated. Heat 1 tbsp oil in a heavy bottom pan. Add Lamb chunks. Brown lamb chunks in two batches, without crowding the pan. Keep aside the browned lamb pieces aside, covered. To the same pan add chopped onion and garlic. Saute until onion has softened. Add browned lamb chunks, sauteed onion and garlic, rest of the ingredients(except 1/2 cup stock and green peas) to the slow cooker. Deglaze the roasting pan with 1/3 cup of stock( from total 2 cups) and add it back to the slow cooker along with any brown residue. Check the seasoning. Slow cook on low for 8 hours or high for 5 hours.